Hi! My name is Wayne and my trail name is KrispyKritter. I sometimes find it hard to describe myself to others. Our perceptions of ourselves can be different from the way others see us. First impressions are usually a good indicator of the character of the person. When pondering the question, "who am I?" my first impression was of a 30 year old man taking care of a 53 year old body. An important element in my hike is to grasp the idea my body at 53 has limitations. Nobody said life was fair. I enjoy being one with nature and surrounding myself with her beauty. People hike the AT for various reasons: to find themselves, escape an event that occurred in the civilized world or the love of the outdoors. 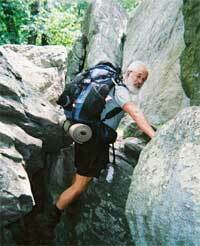 I have a little of each, however my reason for hiking the AT is simply, the excitement of the adventure.